Summary: On the first page, a girl is getting fitted for a new dress made by her mother. 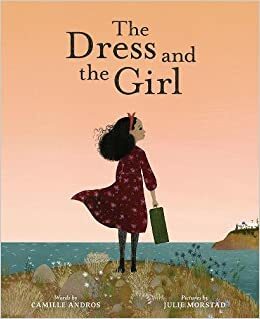 “The dress loved the girl, and the girl loved the dress.” They go through many days together, enjoying life by the sea in their Greek village. One day, they get on board a ship with the girl’s family and begin a long trip across the ocean. When they arrive in New York City, the dress is folded and left in a trunk where it waits for a very long time for the girl to come back. The dress travels in its trunk around the world as time passes and the girl grows up. Then one day, the dress arrives back in New York, where it is hung in a shop window. A woman stops to look at it and remembers all her adventures with that dress. The last page shows her putting it on her own daughter. 40 pages; ages 4-8. Pros: The illustrations steal the show in this book, and, in my world, would be considered for a Caldecott. The story is sweet and another immigrant story to add to the many different takes on that theme that have been published this year. Cons: I didn’t really understand why the dress was left behind and how the trunk ended up in so many different countries around the world.